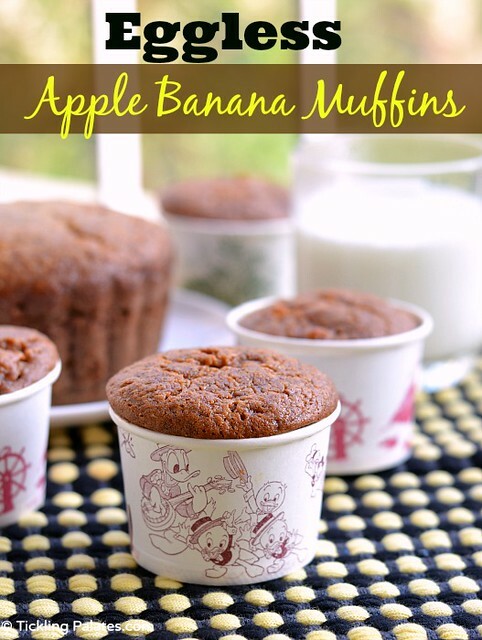 Eggless Apple Banana Muffin Recipe. These delicious, healthy muffins are loaded with the goodness of both apples and bananas and have no eggs or butter in them. You can enjoy them either for breakfast or as a quick snack on the go and enjoy the goodness of fruits at the same time. The muffins were a result of the over ripe bananas that were breathing their last and a lone apple which no one wanted to eat. So I ended up making these muffins to send it for my kids snack time at school. You need not have to take out your stand mixer for rustling up these muffins and no muscle power is also needed as the batter just comes together beautifully. 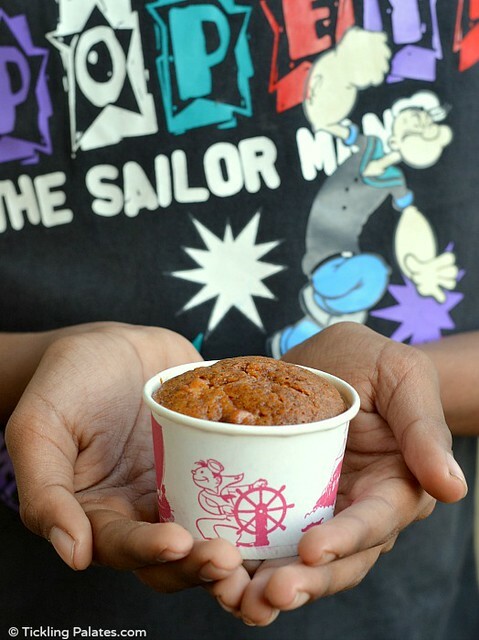 Apart from the fruits you can also add chopped nuts, tutti frutti or chocolate chips to jazz up these muffins which I’m sure will make your kids very happy. The yogurt added to the muffin batter provides the much needed moisture to keep it soft and moist even when stored at room temperature. Instead of muffins, you can also bake the batter in a bread tin as a quick bread and slice them easily to serve for breakfast. Just drizzle them with melted chocolate on top or smear some Nutella and you are good to go with a healthy breakfast treat for your kids. 1. I used 2 large “Robusta” variety of banana and 2 medium size fuji apples. 2. If you want to use an egg, then reduce the vegetable oil by 1/4 cup and replace with an egg. 3. Instead of using blender, you can also do this by hand using a whisk, but I used a blender to get even, smooth batter. 4. While the kids were okay with the sweetness of the muffins, I felt that it was a tad bit too sweet, so I shall use only 3/4 cup sugar from next time on. 5. These muffins work well with over ripe bananas enhancing the taste and flavor. I just made 9 muffins with the paper tea cups and used the rest of the batter to make 1 big muffin by using a pudding mould. Either way, you simply cannot go wrong with this recipe is all I can say and promise. Sieve together flour, baking powder, baking soda, salt and cinnamon powder in a mixing bowl. Roughly mash the banana with your fingers or with a fork and keep aside. Peel, core and finely chop the apples and keep aside. In a blender, add mashed bananas, yogurt, vegetable oil, vanilla extract and pulse at regular intervals till they all are combined well. Transfer the blended mixture to a large mixing bowl. Add the flour mixture in 3 batches while mixing with a spatula. Do not over do it but just mix till you do not see any flour patches. Finally stir in chopped apples and mix to distribute evenly. Pre heat the oven to 180 C / 350 F.
Grease a 12 muffin tray with oil. I used paper cups and did not grease them. Fill the cups with the muffin batter till they are 3/4th full, leaving enough space for the muffin to rise while baking. Bake for 25 – 30 mins or till a skewer inserted in the center comes out clean. Take the tray out and let it come to room temperature. Eggless Apple Banana Muffin are ready. Enjoy either as a healthy breakfast filled with fruits or as a snack. loved that last click. the hand model is awesome and are these the muffins that you were talking about? wow !! loved it !! so perfectly baked. perfectly baked… tempting me to grab it immediately. 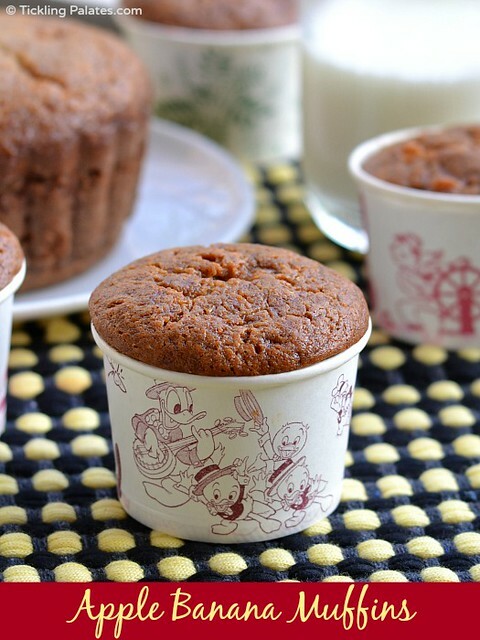 Loved these paper cups / molds… Do you bake in them itself? Delicious. Great success with friend with egg intolerance. The rest of us didn’t miss the egg. Heyy Radhika, awesome recipe.. will try out pretty soon..
A quick query? Did you bake in those papercups? or just used them to display? M running short on cupcake liners, wanted to know if these could be possible alternatives!! Hi Amisha, I baked them in the cups itself. I find that these cups work better and give consistent results than when compared to plain cupcake liners. Do let me know how it turned out for you once you try out these muffins. Ps. Could u suggest some glaze or decorating ideas? I tried dark chocochips. Would appreciate something more beautiful. yaaay…. thanks for the feedback Pratima. happy to hear that it came out well for you. You can melt the chocolate chips either over a double boiler or in a microwave and drizzle it over the muffins or you can also drizzle butterscotch or maple syrup. How long will these last? Will they last a week? The earlier veg cupcakes I’ve made spoil in 2 days. They will last for a week and taste good for a week when refrigerated. If storing at room temperature consume within 2 days as we are not adding any preservatives for longer shelf life. Hi…really liked the recipe..just wanted to know if we can use whole wheat flour instead of maida as i am baking it for my kid? Hi Shweta, yes of course you can replace all purpose flour with whole wheat flour. Hi, sugar which u use in ur cupcakes receipe is granulated or powdered ? Please use granulated regular white sugar. Made these for my 1yo who is allergic to eggs… he liked them and so did the rest of the family! I wasn’t sure what to do about the “yogurt (curd)” so I just tried adding plain yogurt and it seemed to work out fine. I will definitely be making these again! Hi Kristen, Glad to hear that your kid liked the muffins. It is plain yogurt only. Here we also call it as Curd. Thank you for stopping by and for giving your lovely feedback. 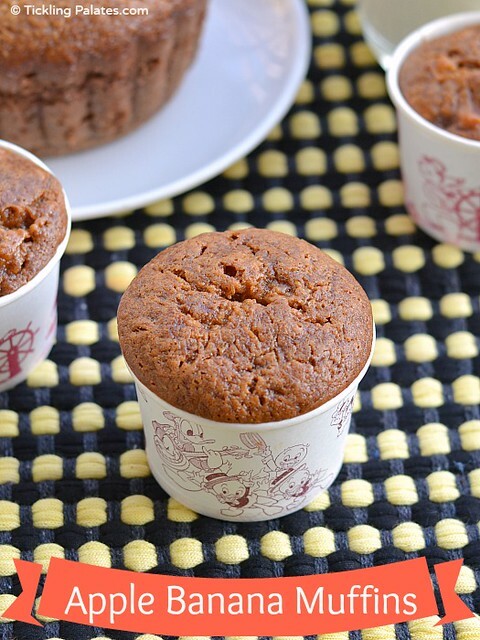 Hi Radhika, baked these muffins few days back…came out so soft, spongy n delicious…had replaced half of flour with whole wheat flour…will try fully whole wheat ones next time….thank u so much for this awesome receipe…. Hi Shalini, You are most welcome. Thank you for for dropping by and giving your feedback. So happy to hear that it came out well for you. 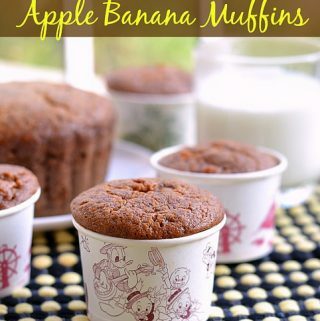 Could you also add mango to these muffins too with apple bananas? Mango is a flavor that will clash with the other 2 fruits. So I would not recommend adding mangoes to these muffins. Hi Maheswari, Thank you for trying and your lovely feedback. I tried your recipe…Muffins turn out Awesome.. Perfect recipe.. These are delicious! Just baked them and couldn’t resist the smell and had to eat one…amazing! I used 1/3 cup of unsweetened apple sauce instead of the chopped apples and added 2 tbsp of hemp seeds for some extra protein for my 1 year old son who is allergic to eggs. I can’t wait for him to enjoy this tomorrow morning. Reading this makes me so happy. I hope your boy enjoyed it.